Tag nr. : White 16 - " Lefty "D.O.B. 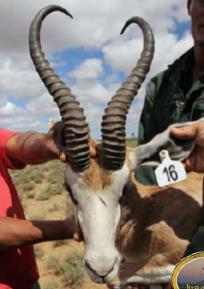 : December 2012Sex: RamTotal: 1Colour: Kalahari springbokBloodline: Jules of the KarooMeasured: 16-3-2016Horn length: L 17 6/8" R 17 4/8"Base: L 6 2/8" R 62/8"Available: ImmediatelyDescription: Kalahari genetics.